A new rival for InkyPen? Just last month, we reported on the news that Inkypen - a brand new subscription service that allows for comic book reading on Switch - would be launching in November. Squeezing in just ahead of that release is a direct competitor under the name of Izneo - a similar app that has been described as "the Netflix of comics". 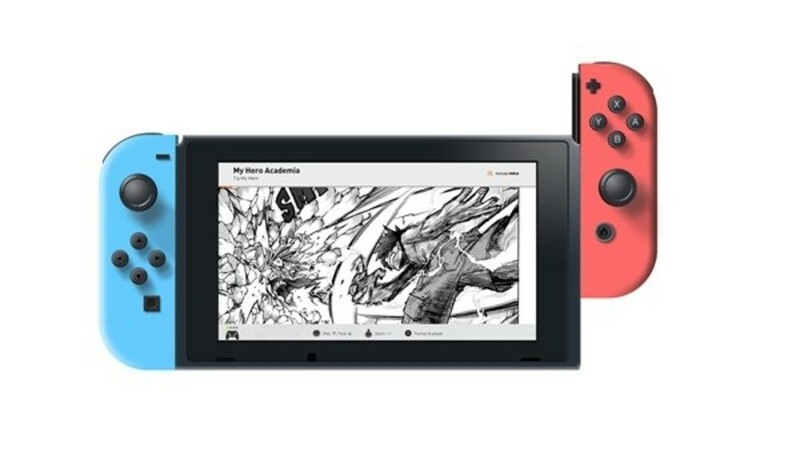 The app - which is dedicated to comics, mangas, graphic novels and Webtoons - will become available on Switch in October. Already available on computers, smartphones and tablets, the Izneo player will allow Switch owners to access and purchase their favourite content from the app's catalogue. This catalogue features thousands of digital comics, all of which will be available to read both online and offline. Titles include Hellboy, Aliens, Buffy, Doctor Who, Blacksad, Largo Winch, and Valerian, not to mention the odd piece of gaming-based literature like Assassin’s Creed. The timing of this new launch seems almost too convenient to be a coincidence; InkyPen's recent announcement caused a good deal of interest among Switch owners thanks to being the only thing of its kind on Switch. It appears that InkyPen adopts a monthly subscription model, whereas Izneo simply sells books for set prices - your reading and purchasing habits may dictate which of these platforms is best suited to your needs. Are you excited to see new apps like this hit the Switch? Would you use your console for activities other gaming? Let us know below. It's fine for those who like seeing a frame at a time (Comixology calls this "guided view") but I prefer looking at a whole page when reading comics. So this requires a big enough screen (8 inches and over) and a resolution sharp enough to read small text comfortably (so above 1080p). The Switch doesn't have either, so I'll stick to my tablet, thank you. I’ll probably go with the subscription-based one since I can read whatever I want as much as I want for a set price rather than just pay for individual items. Izneo would turnout to be much more expensive for all the reading I'd like to do. Did not know about this app. Maybe I will download it on my 6S for comic reading if I feel to. Are we seriously doing this? Oh boy. I mean, I have zero interest in getting multimedia apps on the Switch, but for real? We're getting reading apps? ...Why am I not surprised. Nintendo always wants to be different, even when being different makes no sense. It's fine that we get them, but nobody asked for this. Nobody. Maybe a few people. Thousands, however, asked for stuff like Netflix. Bob: "WAIT, NOBODY ELSE HAS THIS. THIS COULD BE THE NEW EXCLUSIVE FEATURE WE NE-"
Literally the world: "Bob, Bob, calm yourself, there's a reason nobody else has th-"
Bob: "GREENLIT! GOLDEN BUZZER! DONEZO! IT'S GOING TO HAPPEN!" It's a decent idea, but I don't see why I should use this on the Switch over an actual tablet. @iLikeUrAttitude Sorry man, but I think Youtube and Neflix have been sorted behind the scenes. Unforgunately, they will most probably be tied to the online service. It is still good as a games console though. @DannyBoi Although I'm paying for the online service anyway that would be really sad to see basic features that other consoles have locked behind a paywall behind the Switch's online. I don't understand why we have Hulu and now this but no Netflix... not that I'd ever use it anyway. @Realnoize if it's like the inkypen app what's nice is your can dock it & see the whole page or frames on your TV for maximum clarity & visibility. To be honest the concept doesn't work on an iPad, with pages being badly broken up between swipes. wouldn't want to try it on the Switch screen. Plus it's more indie stuff. Guessing most people would want Marvel and DC. @iLikeUrAttitude The online service ispretty barebones soadding something like this toit(in Nintendo's eyes at least) makesit more popular. But tous, it is just locking free things behind payment. Unless they have unlimited access to the majority of Marvel, DC, IDW, Darkhorse and Image comics for a flat low monthly rate, then no... this is not the Netflix of anything. Ehhh, no Marvel so not for me. I'll stick to paper. The weird thing is I now know about these apps because they are on/coming to the Switch. Still not interested though; more if an watcher then a reader when it comes to stuff like this. I'm not sure why people are blaming Nintendo for not bringing Netflix to Switch, because I'm pretty sure it's completely up to Netflix. Same goes for Youtube etc. Some may like that, but I never actually asked the question myself if I'd ever want to read comics on a TV. It sounds so absurd to me (but that's me) that the thought of it never even occurred in my mind. Ever. I like having it on a portable device because, like comics, like books, I can bring them everywhere and read them everywhere. Being tied to a TV to read my comics is a huge inconvenience to me. Most of my reading is done in the commute ride every day, or in bed, or... at place other than in front of my TV. @DannyBoi Dude, it's best to drop your obsession with the Nintendo Switch's Online Service. Everything you say goes into the ear and out, nobody cares! You don't have to keep repeating it over and over again, it's not healthy. How about we get the Netflix of video streaming services? What was that application called again...? How bout they allow us to print some of the issue for ourselves to read then I'll be happy to apply for the service. Switch had bluetooth capabilities and my recently bought printer had bluetooth connection, hopefully Nintendo someday incorporate a printing feature for the Switch too like how the Game Boy had the GB Printer. If they have "The Adventures of TinTin and Milou" I am in. @Blizzia What makes you think Nintendo has anything to do with this? Whoever made the app probably just decided to bring it over, you expect Nintendo to deny them that because... it's not something you asked for? @DannyBoi Why would they be locked behind a paywall when Hulu isn’t? Finally some comic readers are on the way for the Switch. I've been waiting for this (and video streaming apps and a browser) since the Switch's release. This sounds really neat, I've yet to hear of the service but I think I'll check it out. I mostly use Comixology now and it's nice, but sometimes hard to justify spending on comics when they end with a classic to be continued. Willing to bet the UK won't see this. At least, not for awhile. ill keep my switch exclusively for games and my iPad for reading and watching videos. If someone had a service where if you bought a physical comic but also got it digitally for reading on the go, I'd consider a comic reader app. I tend to buy graphic novels instead of single issues so that could be more useful. Trying the digital version right now. It's not super clear yet where one goes to pay, nor how much it is. As is it's a cute little shop, but seems to have a very limited selection. If you like Assassin's Creed though they've got a ton of that. Yeah, I'll stick to my Chromebook. It uses Comixology and can pull comics I bought that are drm free. I just want Plex on the Switch. The nickname for Izneo is misleading. To me, that meant a sub that gives you access, which is not the case as you have to buy them? Inkypen sounds more like the Netflix of comics with a monthly sub. @Riderkicker I'd like that for everything physical media that I buy. @Realnoize ah I gotcha. Yes I can absolutely see if your a commute and outgoing reader how that would be useless. I don't think I'd mind trying it out tho and seeing how it works for me. @ThatNyteDaez I read that this app also features comics made in the UK, so it might be there. Still need to know how it works internationally. Services like this tend to be region based. @Realnoize I actually like the "guided view" in ComiXology, I turn on the setting to show full page on page exit though, for some comics the context of the panel layout is important. I've got no interest in reading comics on my Switch or on a TV and personally no interest in a subscription comics service, but I'm sure it will work for some people. I have a big library of comics on ComiXology so if they released an app on Switch I'd probably get it, but happy enough to leave reading on my tablet and just games on the Switch. Having a tablet and a Switch is a luxury though so I can understand why some people would want media apps like this. Oh boy. Nintendo has everything to do with this. Like they do with every single release on their platform ever. You don't release anything on a Nintendo platform without their approval. You can't. So they had everything to do with it, because they need to approve it. It's pretty clear Netflix has been trying to get a release on Switch for a while now, and Nintendo are stonewalling them. It has absolutely nothing to do with me not asking for it. It has something to do with Nintendo approving things literally nobody has specifically asked for on their platform, while stalling out things people really want. Again, I couldn't care less about either app, my Switch is a gaming temple, and it will not be used for anything but gaming, ever. But we all know releasing Netflix on the Switch would've been a snap of a finger, and that Netflix's philosophy is to be everywhere possible. They've also been in talks since god knows when, and Netflix was on the Wii U as well meaning they already had a solid working relationship. @Realnoize True that. Full page composition is important. @Blizzia Yes and no. Nintendo isn't telling Netflix a hard no, nor are they telling any other app that. All signs point to them saying "No, we won't implement the particular encryption you want. Pick another one or move on." And companies that are using the other encryption are being allowed on. So that's still an issue, but you're completely misrepresenting it. In that case, wouldn't InkyPen be the Netflix of comics, while Izneo would be the Kindle of comics?